Nothing whatsoever like the picture shown online. Extremely poor joinery, splinters coming off, bare wood exposed etc. This should be labelled 'barn wood' perhaps, because it seems that the intended look is recycled. The paint is uneven and overall quality extremely poor. Thank you for your review. The Barn Wood Collection is 100% reclaimed barn wood. The frames have natural elements in the wood. The authenticity of the frames are in the rustic profile. If you would like to return the frames, please give us a call. We have other frame collections that present a rustic look. Please allow us to make this right with you. Needed a large, barn wood type floater frame for a painting I did and this was perfect. 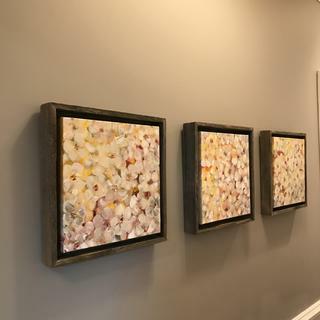 It was shipped quickly, was easy to hang and perfectly accents the painting. Very nice to be able to purchase oversize floater frames here. Many other outlets don't carry frames this large. 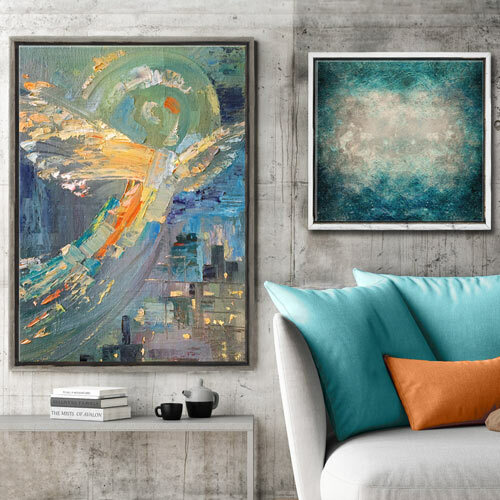 This frame made an ordinary wrapped canvas piece look so much more worthy of display! Great frame. Nice and rustic is the looks were are trying to achieve and have succeeded with this beautiful driftwood frame. This frame was exactly what I wanted for this wonderful picture of my daughter. She is in the Peace Corps, serving in the Philippines. It makes us happy to look at her obvious joy. Great frame for my favorite picture. Really like this frame. I did put a little wood glue on the back of the frame because the old wood appeared in danger of splitting in a couple of spots. Not an unexpected situation any time you use very old, dry wood to make something. Hello Lewis. We appreciate you sharing this awesome artwork with us. As you know the frame is an authentic weathered barn that has been exposed to the outdoor elements. However, we want to make sure the frame has the best quality. If there is an area of improvement we can make with your order, always contact us so we can make it right with you. Thank you so much for being a valued customer. Have a great day! I love this natural looking wood grain frame with just the right amount of light color varnish, not too dark. It is a substantial frame with nice depth that sets off large paintings nicely. It is perfect dimension and holds painting in floater style evenly on all sides. I would definitely purchase again and would recommend to others. A great buy. 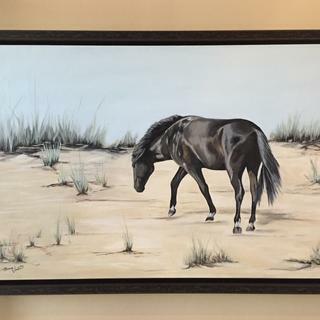 “The Intepid Coastal Pony” 24x36 original acrylic painting by Diana Vincent. Love the frame! A beach rustic look which is just what we were looking for. Shipped quickly and easy to mount! This frame was exactly as I expected and worked well with my painting. Loved the rustic finish. I love these frames. They really capture the beach casual look in going for an they complement my paintings beautifully. This rustic frame only needed minor touchup with putty on the back to prevent light from coming through. The look is great with hammered copper mirror frame nearby. As expected, a little more than I usually spend on a frame but I liked the look. Perfect frame for my nautical and sea shore oils. Timely arrival, easy to assemble and affordable. Perfect fit and was easy to mount. I would recommend anytime. Selection of the proper frame is critically important. It is really barn wood just as I was hoping, nail holes and all. Easy to attach to painting. Love it! 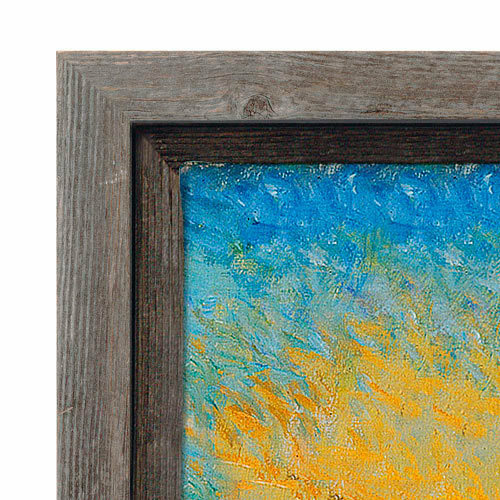 I recommend this driftwood floater frame for blending well with paintings or images historic in character. I was looking for a real wood, barnwood, driftwood, whatever kind of look, and this was it! 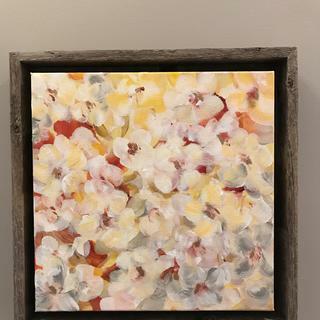 I just started framing canvas pieces, and this one worked just perfectly. I would consider this more barnwood than driftwood, but it's super light (in weight) and looks fantastic. This is a great frame it it fits my art like a glove. I will redress a pair. They arrived in fine shape. All corner joints were very clean. I was expecting some distressed / aged wood characteristics and not to be perfectly uniformed wood surface. One frame appeared to have untouched surfaces, whereas the other had some lightly sanded surfaces, so a lighter brown tone instead of the aged and weathered gray. It looks great, but the barnwood is a bit prone to splitting. I attached the hanging wire to the canvas spreader, rather than the frame. Hello Charles! Thank you for taking the time to give us your feedback. 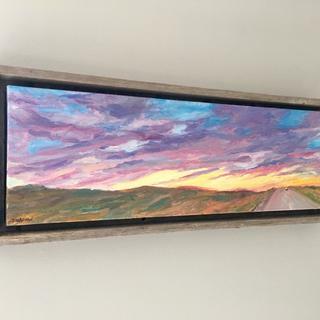 These reclaimed barn wood frames are a piece of history transformed into art! We try our best to keep the authenticity of the moulding and it's beautiful rustic elements. We would really like to see photos of the frame where the splitting has occurred. Can you please email those photos to customercare@pictureframes.com - Attention Shea. If I find that the frame should be replaced, I am happy to send you a free replacement frame. Please let me know what suits your needs the best. Thank you for your business! These floater frames made my canvasses really stand out. First time using them and will probably use them again. The driftwood like frame truly is beautiful, however I was surprised it did not come with glass, and was very deep, as if to hold a canvas painting... I purchased this frame for an odd sized matted photo I'd received several years ago. While it still looks nice, it's not what I expected, thus the 4 stars. Hello Julie! We are so pleased to know that you love the look of the Barnwood Floater Frame! We regret to inform you that this frame is NOT for a photograph or poster, but instead this frame is for canvas only. The frame is not meant to hold glass or foam core. We apologize if you were not aware of the purpose of this frame and we have emailed you a UPS return label. Please follow the instructions in the email that contains the UPS return label. Once you have returned the frame, we will issue you a full refund. Please do not hesitate to let us know if you have any additional questions. Thank you for your business! I like the style and color of the frame but it was just a bit rougher than I expected. I had to use filler on one corner and sand and then touch up with stain. After all that I am very pleased with the final look of my artwork. 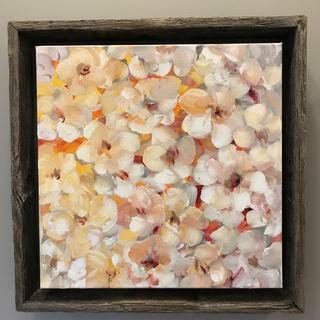 The subject of the painting was a very old barn, so this rustic frame was the perfect choice. This was a first time for me framing a canvas, and the instructions were easy to follow. Love the wood, love the color, but for price and how many imperfections it had, I think it should be cheaper honestly. I received one that was badly produced, but customer service was excellent and sent me a new one. Driftwood look was what I was going for, so it looks great with my canvas picture with beach birds. I love it! The rustic frame looks like it came right out of an old barn. I would recommend this to others. My daughter loved it. My only slight criticism was that, when the frame was held up to a window or light source you could see light through the seams where the outer and inner part of the frame was joined. This would not show when hung on a wall of course. OMG. It's like real weather-beaten wood that's been outdoors for years with naturally occurring knots and imperfections. Good look, quality. I wish the interior was black. t would set off painting better. I like this frame very much. Perfectly suited for the subject. I struggled with installing the canvas. This is the first time I have tried a floater frame and found it very difficult. I ended up using hot glue as I couldn't get the canvas to stay straight and evenly centered while trying to nail it in. Will probably purchase a standard style frame next time. I don't have a lot of experience so I found this very challenging to work with. The frame is true weathered driftwood and gives a handsome look to the picture, but is a bit flawed in one of the sections. Seems like part of the wood chipped off, but I found none in the packing. I darkened the section with watercolor paint and it looks fine. Overall I liked the frame-but it is very rough. Having 3 inch splinters so if you run your hand down it you could impale yourself. So a little sanding down is probably required for safety. It did give me the look I was going for though. As a mosaic artist I am constantly looking for quality framing that doesn't cost an arm and a leg. This was a little on the pricey side but the quality (besides the splinters) was great! I will definitely order again from this company. 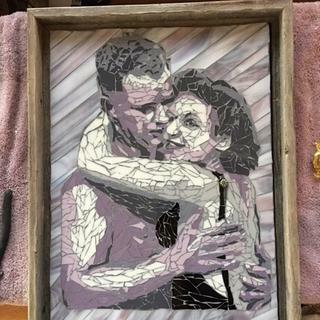 Mosaic I did of a friends parents who have both passed away-she is using it at the memorial. Shipmnt showed tbe following Tuesday.10 days later,Well I missed my commitment and had to discount my product. Not happy about that. Both frames ordered were perfect. They look marvelous with the artwork. But, I did pay extra for two day air. Orderd them Fri, Mon was a Hol. Hello Tim. We regret that the order did not arrive in the expected amount of time. We sincerely apologize that you had to discount your product being sold to your client. Due to the delay with the arriaval of the order, we have issued you a refund for the cost of two-day air. We will email you a refund verification notice which will confirm the refund amount. If you have any concerns regarding our resolution, please let us know. Again, we apologize for this rare sevice breakdown. I was expecting to receive the rustic barn yarn look, but its really a dirty sight, with sections of the frame greased or darkened. Moreover, the person who made the frame put the dimensions of the frame in marker on the outside portion (off white) of the frame in full view 24 x 36. I needed to paint the frame to take it out. Is this what's meant by rustic? I think it's more like a careless mistake. Hi Richard. Thank you for your review. We regret to hear that the frame arrived this way. This is certainly not the experience we wish to leave with you. Our customer care team is happy to help make things right for you. They can set up a replacement frame to come out to you at your request. They are in the office Monday-Friday 8am-7pm eastern time and can be reached at 1-800-332-8884. We appreciate your business and look forward to hearing from you! This frame is very rustic but compliments my work beautifully. I have photos but they will not upload. but overpriced for what you get. I did like that it was one of the few floater frames that went down to a 5" x 5" and I like the look. But for it's rustic quality, it didn't seem lined up well, a bit off. Hi Kristin. Thank you for your feedback. 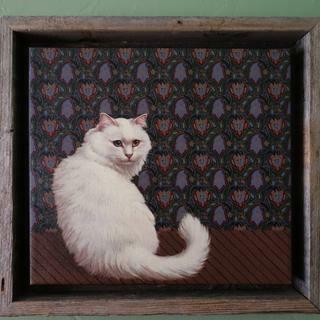 We regret to hear that you weren't entirely satisfied with the frame. This is certainly not an experience we wish to leave with you. We do have a 45-day return policy in place so that you can find the perfect frame for you. Our customer care team is available by phone at 1-800-332-8884. They are in the office Monday-Friday 8am-7pm eastern time. We appreciate your business and look forward to making this right for you! Not too happy. Wood frame was pulling apart in corner. Not very well put together honestly. Hello Lynda! Thank you for placing your recent order. We regret that you are not 100% satisfied. We are happy to rush you a free replacement frame. These beautiful, rustic Barnwood Frames are made from real barns turned into frames. We are hoping you can provide us with photos of the frame so that we can examine the frame more closely. If you would like a replacement or a refund, please let us know. We can be reached at 1-800-332-8884. We look forward to making this right with you. Thank you for your business. I was actually very disappointed in the frame. Granted driftwood is not smooth or straight but the frame had several gaps. The most disappointing part was that when they color treated the frame to make it uniform gray, they didn't even spray about a 4 inch section so it was the blond wood color. I definitely don't recommend it. Also they shorted me 2 screws with the hardware so I have to make a trip to the hardware store. And no, I did not call the seller to complain. Didn't have time to deal with it so I hung it anyway. Hi Diana. Thank you for your review. We regret to hear that the frame did not suit your needs. We do offer samples of all our frames, excluding clearance, so that you may see and feel the frame before you purchase. Since this is made of recycled materials, no treatments are used on the frame. Our care team can quickly resolve any issues you have regarding your order. They are available Monday-Friday 8am-7pm eastern time and can be reached at 1-800-332-8884. Thank you! Not worth the money. The clips didn't fit properly and the "driftwood" frame split as soon as the clip screw was inserted. Took me an hour and a half to jury rig the frame, and glue it. And $18 to ship a tiny, glassless frame was ridiculous! Hello Janet. Thank you for your feedback. We certainly don't want to leave you with this experience and would like to make this right for you. Because this is a canvas floater frame, it does not have the ability to hold glass. We can certainly send out additional clips to make the frame more secure for you. We can also set up a return label for you if you are not able to utilize the frame. Please give us a call at 1-800-332-8884 and let us know how you would like to proceed. Thank you for your business. We look forward to speaking with you! Had to order another frame that would fit a 3/4" stretcher. Hello Greta! Thank you for taking the time to submit your review. We are happy to hear that you were able to order the frame you needed with the appropriate depth. We have the depth of each frame listed as the 'rabbet'. You will find the profile of the frame, which includes the rabbet/depth, listed under the image of the frame. We appreciate your business and hope you have a wonderful day! It was terribly made and I returned it for a refund. In the past I’ve had good frames, but this one was awful. Hi Thank you for your feedback. We are very sorry to hear that you were not happy with your purchase of the Barnwood frame. We know,when it comes to Barnwood, that these frames are very rustic and no two frames are the same. We understand that sometimes that is not what someone is looking for. We do confirm that your return was received and your refund subsequently issued. If we can be of further assistance, please do not hesitate to call. Quality of wood was terrible. If I had not been so busy, I would have tried to return the frame, as there are places where there are large chunks of wood missing, that show. It does not look rustic, it looks like it is falling apart. I was sad, as I wanted that weathered, grey wood look. Should be a half star or 0. Hello Roberta. Thank you for your review. We regret that the frame did not work out for you. We are going to investigate the entire batch of the frames to make sure the moulding is in good condition. Please give us a call so we can set up the return authorization. Check your email for the UPS return label to mail the Barnwood Frame back to us. Once the frame is returned, we will be happy to refund you for that particular frame. If you need further assistance, please let us know. 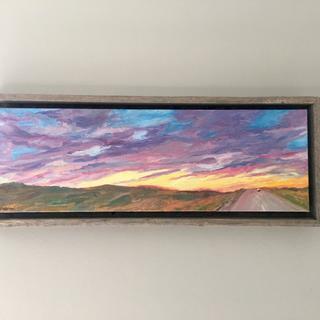 I ordered a 24x36 BWF2 gray driftwood frame in April 2017 and the product was well constructed from quality recycled wood. It resembled the product image on the website and met my expectations. I just received delivery of two more BWF2 gray driftwood frames (16x20 and 24x30), and the quality is completely unacceptable. The wood is brittle and is splintering throughout. The corners are poorly constructed and flimsy, and there are considerable gaps in the joinery through which you can see the wall behind the framed image. Extremely poor quality materials and a shoddy workmanship. I understand that these are made from recycled wood, but that is no excuse for choosing wood that is obviously too brittle and not straight enough to achieve tight joints, and for trying to pass off a poor quality frame at a premium price. Hello Damien! Thank you for placing another order with us. We sincerely apologize that the frames did not meet your expectations. You are correct in saying these are authentic Barn Wood Frames from actual barns that have a very rustic appearance. However, we do not want you to experience any splintering from the frames. We have found that during shipping these authentic Barn Wood Frames are being jostled quite a bit. This may cause the gaps in the joinery. That is not the impression we want to leave with you. Please allow us to make this right with you by sending a replacement for both frames in size 16x20 and 24x30. We ask that you provide us with photos of the frames so we can share this with our Production Team. Once you email us the photos, we will set up a free replacement order for you. We look forward to resolving this with you. Happy Framing! 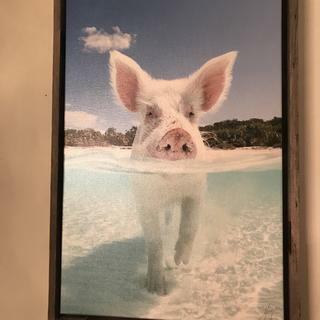 One of the few floating frames deep enough to accommodate a 1 1/2" deep canvas. Recycled barnwood is a plus. It will accentuate a colorful piece in an odd size. I like the floater look for a stretched canvas. Decided a barn/driftwood wood type frame might work nice with wildlife artwork! This frame will fit my 1 1/2" deep canvas painting of Christ of the Cross. 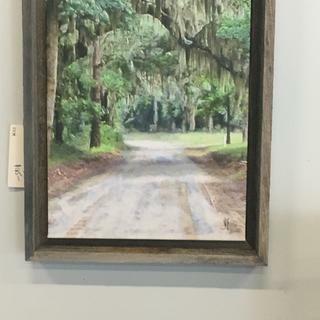 The distressed/rustic look of the frame compliments the scene nicely. Perfect place for a nautical painting to reside. 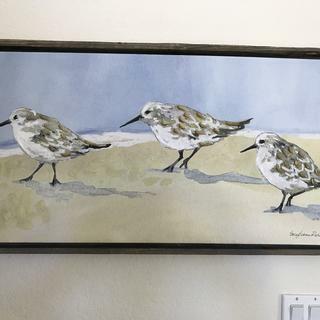 Compliments my nautical and coastal beach paintings. The driftwood gray goes well and adds a rustic touch to a large picture of a snowy owl in flight. I have ordered this frame before and it looks great on my canvas picture of a barn and other farm scenes I have used it on previously. I paint a lot miniatures on small stretched canvas with pretty thick stretcher bars. The rabbet can be accommodated by this frame. Rustic qualities. Will be framing a whimsical, colorful painting of cow and like the contrast of the rustic with slightly modern. I am painting an old street scene; brownstone, barbershop etc. This frame will lend to the old city scene. I like really the 'barn wood" look for my paintings of seashore and mountain landscapes. Suited the beach theme of the painting. Will look nice on my entertainment wall that has river rock on it. I took a photograph in March in NH when the sap was running and snow was on the ground. There is a part of a dilapidated barn in middle ground on the right. The frame is simple and will enhance the subject. 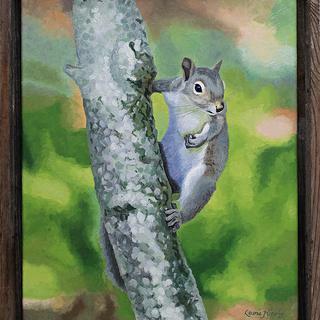 The painting is done in acrylic. I need the grey to be a medium to dark grey. I saw the floater frames when I attended an art sale in Rockport Texas last month. I thought they truly put the paintings out in front of the viewer - I was not just seeing the frame. Had to have them for my paintings. 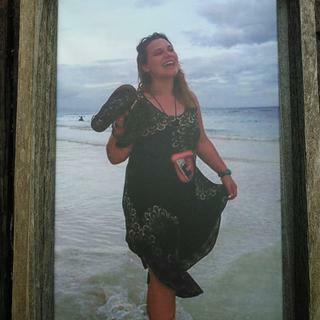 I am using it to frame a picture of my daughter on the beach in the Philippines. 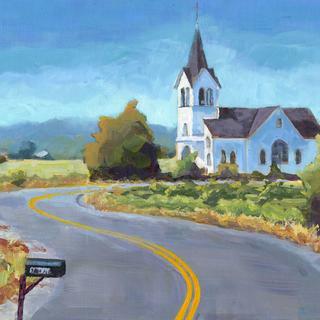 The composition will work well with the background. 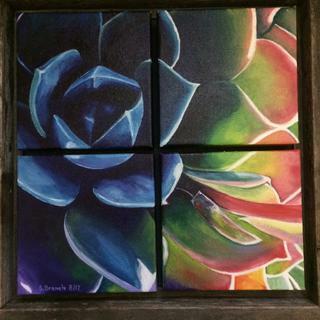 What dimensions should I order relative to the canvas? Should it be the size of the canvas itself? The size of the canvas plus the desired gap between the canvas and the frame? The outside dimensions of the frame? Please advise. BEST ANSWER: Hi Kristy. You would need to enter the exact size of your canvas. The floater part of the frame is already accounted for. Thank you! 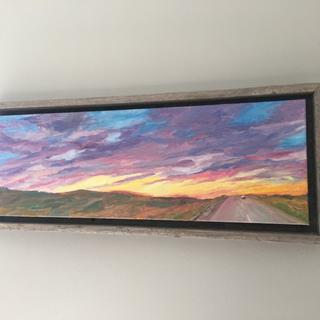 looking for 12" x 48" barn wood canvas frame-thank you? BEST ANSWER: Hello! This frame does not exceed a size of 42". Please consider the frame style below. Thank you for your inquiry! My canvas size is 36 wide x 20 high...but little less than 1” depth...can I still use floating frame? BEST ANSWER: Hello! Thank you for your inquiry. 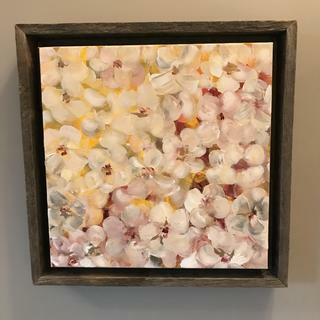 You can use this beautiful rustic frame with the canvas depth you have, however, please be aware that the canvas will recess inside the frame by 1/2". Having the canvas recess slightly is not out of the norm. It is simply a personal preference for your viewing preference. There are ways to make the canvas more flush with the face of the frame, or you can consider our other floater frames. At this time, we have our Rustic Floater Frames in 1 1/2" depth only. We have other Metal or Wood Floater Frames available in the depth/rabbet of 11/16". See the image below for two of the suggestions we have for you. The CF3 is wood, and the 720GUN is metal. Both colletct Please let me know if you need further assistance, we can be reached at 1-800-332-8884, or reply to this correspondence. Happy Framing.